During the month of October, I will be participating in the Write 31 Days hosted by Crystal Stine. My category is Food, Health & Wellness and my theme is "Into The Kitchen". We all had to learn to cook somewhere, from our mothers, grandmothers or on our own. While I didn't spend a lot of time trying to learn from my mom (I think my words were "I'll learn to cook when I need to") I picked up a lot more than I realized. Kids are sponges you know, they soak up a lot of stuff. So fast forward to being married and needing to put meals on the table. Yes, I did, and no, we didn't starve or die from them. Were they good? Yeah, I thought so, but was I really cooking? Eh... If you call boxed mac & cheese, sausages and the occasional vegetable cooking, then yes. I put hot food on the table. 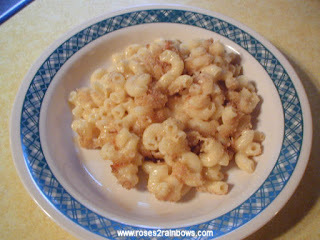 Now don't think this was all bad, hubby loved the mac & cheese! Then everything changed. I discovered the Food Network (the way it was back then, not now), back in the day of Emeril Lagasse (Bam! ), Alton Brown (Good Eats), Jamie Oliver (The Naked Chef) and Rachel Ray (30 Minute Meals). I really learned something from these people. I learned about sauces and seasoning, and the reasons behind what works and what doesn't. 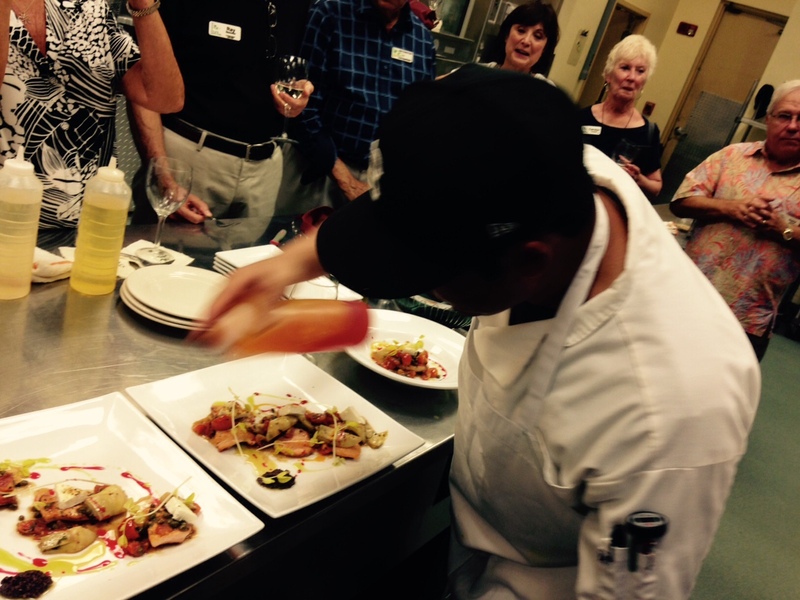 I learned how to chop, slice and dice, how to hold a knife, about yeast and EVOO. I learned you can put good food on the table fast, without picking up fast food. I don't watch the Food Network much anymore, as it seemed to change from educating to entertaining. While it was entertaining back then, too, it was way more instructional and informative. My take-away from this is that now I can make a cheese sauce for my homemade mac & cheese that doesn't break, I can create my own recipes, and of course, make my own pizza. Who are, or were, your favorite TV chefs? I don't think there is anyone among us who doesn't like to save money, especially when we see prices going up and the size of the container shrinking. I remember going shopping with my mom and regularly being able to get ground chuck on sale for 99¢ per pound and today the sale price is usually at least three times that. So how do you save money and still put meals on the table every day? The short answer is know where, when and how to shop, but with our busy lives today that isn't always easy and sometimes impossible. 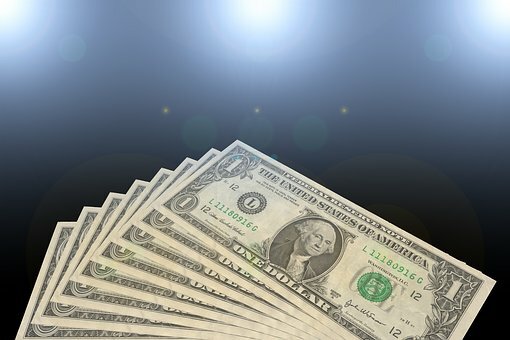 There are thousands of articles and numerous blogs devoted to practical money saving tips, deals and coupon match-ups and I will link to some of those at the end. But first I will outline some of my favorite money saving strategies. 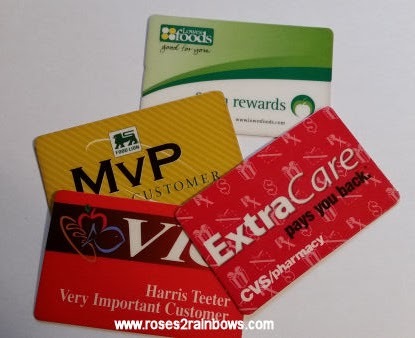 Many grocery and drug stores have their own loyalty cards and related programs. Each store runs a weekly sales ad in either the Sunday or Wednesday newspapers, at least in my area. There are multiple ways to save money here. You can plan your meal to take advantage of what is on sale, then simply present your card and save. Some stores will offer special savings in the form of store cash. This usually prints out on your receipt for use in your next transaction. At CVS, these are known as Extra Bucks and you find these deals listed in their sales flier. Pair these deals with coupons for additional savings. Large department stores such as Target and Walmart have their own savings programs. Walmart has the Savings Catcher Program and participation is easy. Download the Walmart app to your phone or sign up online and that's all you need to get started. The way this program works is simple, Savings Catcher compares your purchases to the advertised prices of their competitors. If Walmart's price is higher, you get the difference back. Your cash back is saved with your account and you can request an e-gift card at any time (to be spent at Walmart, of course). Just scan your receipt after checkout and give it about three days to see if you're getting money back. Target also has some unique ways to save money. First is their cartwheel app, which has now been combined with your Target account login. To save, just log into Target, open the cartwheel app and add products to your list. You will have a bar code with your items encoded. 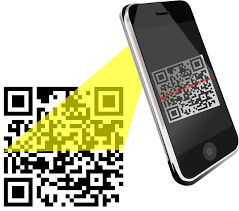 Just show the cashier your phone and she can scan the code. For example, you may add soda to your list at 25% off. Your $4 soda is now $3 all because you took a moment to use the cartwheel. Another way to save at Target is to take advantage of their gift card promotions which are listed in their sales flier. You purchase certain items for a specific dollar amount or number of items, such as any three bags of cat food or buckets of cat litter of brand X (mix or match) and you get a $5 gift card. I have done a number of these promos, and again, the gift card is for Target only. As always, if you use coupons with these programs and promotions, you increase your savings. Coupons can be found in your newspaper most Sundays, and on several internet sites as well. Great savings can be yours if you combine a high-value coupon with a sale such as buy one get one free. Example: I bought name brand chicken tenders on sale at buy one get one free and used a 75¢ coupon which the store doubled (did I mention there are stores that will double coupons?) and so each bag was about $2.75, which was less than half-price. Now that's my kind of savings! If you use a certain food or ingredient frequently, you may find that it is more cost effective to purchase it in larger quantities. For example, if you bake a lot you are probably buying a lot of flour, sugar, etc. If you have room in your pantry, consider purchasing these items in 25 or 50 pound bags. Not every meal is eaten in the kitchen, and going out is expensive. Hubby and I frequently share a meal and it not only saves money, it saves calories, too. We get to enjoy satisfying meals that we wouldn't order because of the cost. Many entrees in your nicer restaurants carry a $20+ price tag, then you add drinks, appetizers and/or dessert. We don't eat like that and still pay upwards of $50-60 (after tax and tip) on a splurge. It's crazy! Needless to say, we do not do it very often. If you are overwhelmed and stressed out over finances and want to jump start your savings, here are some links that really helped me learn how to get the most out of my dollar. Sundays can either be busy with church, social or sports activities or lazy afternoons to be whiled away with a book or taking a leisurely walk with mother nature as your companion. Whatever your day holds, you will likely still be putting dinner on the table. For me, Sunday dinners usually mean either leftovers from the week or something simple I can whip up in a jiffy. Wow, I haven't used that word in a while. It reminds me of my mom telling me something or other would be 'ready in a jiffy'. 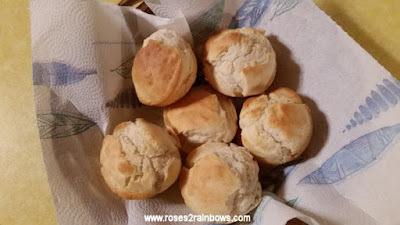 One of the things she would whip up to go with dinner was what she called lazy bread, which is something akin to drop biscuits, I think, only with a softer dough. Anyway, maybe one day I will run across her recipe. In the meantime, I found this recipe for mayonnaise rolls. These are so easy and quick to make and bake. Hot bread is on your table...you guessed it–in a jiffy. I say the sugar is optional because I have never added it, and we love these rolls as is. Also, please heed the mayonnaise warning. I gave this recipe to a co-worker once, and she reported back to me that it didn't work which was because she unfortunately had used light or non-fat mayo. Mix all ingredients together, and spoon into a greased 6-cup muffin pan. Bake at 425° for about 10-15 minutes or until golden brown. The recipe may easily be doubled. 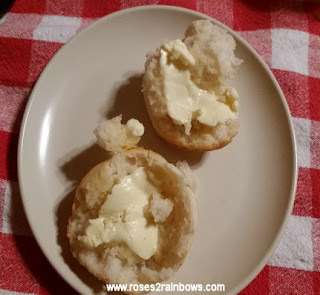 Whether you are putting a simple dinner together on a Sunday evening or want some hot bread to go with that soup that has been simmering all afternoon, these rolls are the answer. We are half-way through the month and well into Fall. What is more comforting on a chilly evening than a nice, hot, one-pot meal that is as easy to make as it is delicious? Grab your knife and follow me into the kitchen. 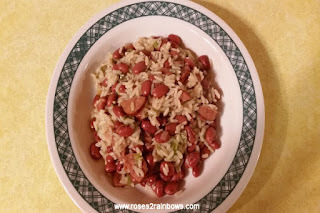 Tonight we are making a quick and easy, one-pot version of the famous Creole Red Beans and Rice. Red beans and rice were typically made on Mondays years ago. Monday was wash day and the women would set the beans to cooking and go about the business of washing the clothes while the beans simmered away. Now before you go getting your knickers in a twist, I know that this isn't authentic, okay. Now that that's out of the way, we can get on with it. Heat about a tablespoon of olive oil in a heavy, lidded sauce pan over medium heat. Cook the onions until they soften, then add the sausage. 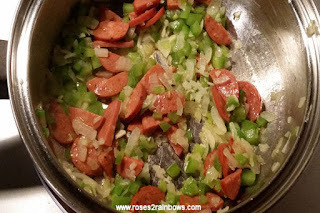 Continue cooking until the sausage is lightly browned. Add the remaining ingredients, except for the rice. Bring to a boil, then add the rice, reduce the heat to low and simmer for 20 minutes. Again, I seldom measure, so amounts are approximate and customizable. 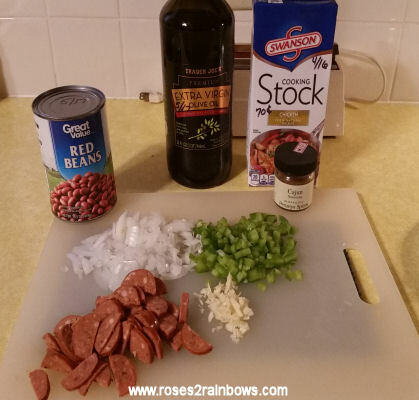 If you want a creamier dish, you may take about 1/4 cup of the beans and 1/4 cup of the stock and puree them before adding them to the pan. To make it a vegetarian/vegan dish, use vegetable broth or water and omit the sausage. For a less spicy dish, use smoked sausage instead of the Cajun style. Stay tuned for more great one-pot dishes. Yes, you can make your own pizza! Pizza is one of the most popular foods in the U.S., but where did it originate? It could have been as the flatbread of ancient times in the Middle East. It could have come from the Greeks and Romans, who baked flatbread topped with olive oil and seasonings now known as Focaccia. However, most historians agree that pizza as we know it today did, indeed, originate in Italy. In Naples to be exact. A baker named Raffaele Esposito was asked to make a pizza for the Italian King Umberto I and Queen Margherita in 1889. His creation, made with mozzarella, fresh tomatoes and basil, is still made today and known as Pizza Margherita . Pizza migrated to the U.S. by way of Spain, England and France but did not become popular until after World War II. Our Americanized version of pizza has made it's way back to Italy and is popular there as well. Many chefs and home cooks will argue that the secret is in the flour, so let's explore some different types of flour you might use. All purpose flour is a blend of hard and soft wheat and is so named because it is suitable for most baking needs. Bread flour, on the other hand, is high in gluten and therefore excellent for bread and pizza dough. And lastly, there is an Italian 00 flour, which is lower in protein and highly praised for making great pizza crust. However, availability and price may preclude this for many of us. I just use a good-quality bread flour, and here in my kitchen that is good enough. My favorite cheese is Sargento's Off the Block mozzarella, but I'll use whatever I have a coupon for and/or is on sale. 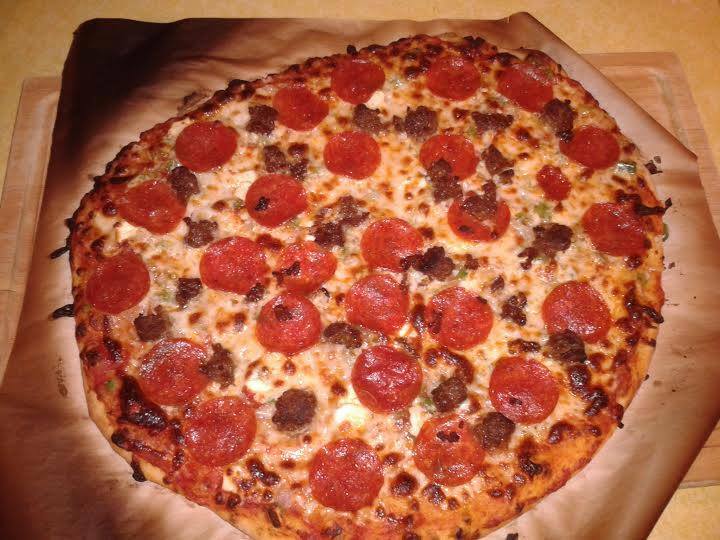 Some of our favorite toppings include pepperoni, Italian sausage, onions, green pepper, and green olives. 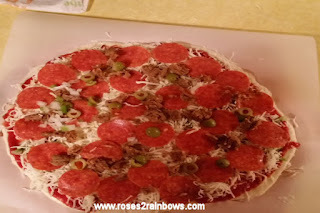 I have already posted my recipe, but there are a few things I omitted since they are not critical to a good pizza. I happen to dislike the large bubbles that often form in the crust. To avoid this, after I roll out the dough (yes, I use my rolling pin), and take a fork and dock the dough all over, in other words, I poke holes in it. This gives me a flat pizza, but if you don't mind the occasional bubble in your crust, just ignore this step. Another thing I do that I learned from Alton Brown, is to oil the edge of the dough with olive oil before baking. Does it make a lot of difference in the overall scheme of things? Probably not, but the crust is a nice golden brown. Not everyone has a wood-fired pizza oven (I don't, but I know someone who does). If you don't, then turn your oven to it's highest setting. 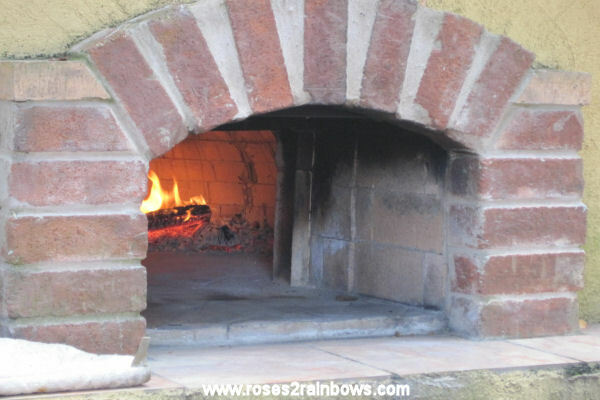 Mine goes to about 550°-600° F. I use a pizza stone which I always keep in the oven on the bottom rack. Preheat for at least 30 minutes for the best results. My pizza cooks in 8 minutes. 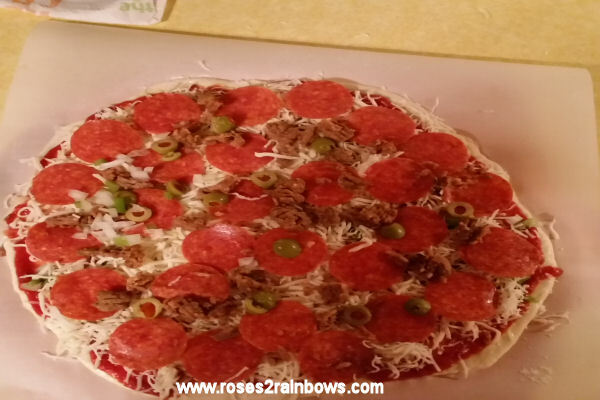 If you are using a pizza stone and peel, roll out your pizza on parchment paper. It makes the transfer to the stone much easier. The pizza and the parchment paper go onto the stone. Our process is when the pizza is done, hubby takes it out stone and all. He then slides the pizza with the parchment onto a wooden cutting board where it slices it, after which he slides it back onto the hot stone. This way the pizza stays hot down to the last delicious slice. There are recipes out there with more complex instructions and more detailed ingredient lists, but this is definitely great for beginners or anyone who just wants a good homemade pizza. What's your pizza? Delivery, take-out or make your own? 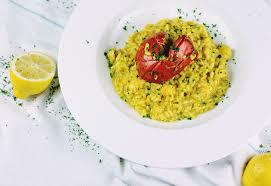 How many of you have ever eaten yellow rice? It's good, isn't it? I thought so too. Then one day, as with other pre-packaged food I enjoyed, I decided to make my own. It is really quite simple, and you can customize it to your own taste. Even better is the fact that your rice doesn't have all the extras such as MSG, anti-caking ingredients and loads of sodium. What's in that package, anyway? This is what is in a national brand of yellow rice. I am not saying it is bad, what I am saying is if you want to control what is in your food, make your own. "Enriched Long Grain Rice [Rice, Niacin, Iron (Ferric Orthophosphate), Thiamin (Thiamin Mononitrate), Folic Acid], Saffron Yellow Seasoning [Salt, Sugar, Dehydrated Onion, Monosodium Glutamate, Turmeric, Garlic, Corn Starch, Spices, Safflower, Saffron, Silicon Dioxide (Prevent Caking)]." Place about a tablespoon of olive oil in a covered saucepan and heat over medium high heat. Add the onions and cook until the onions soften, then add your salt and pepper, chicken stock and saffron or turmeric. When the liquid begins to boil, add your rice, stir and cover. When it returns to a boil, reduce heat to low and cook for 20 minutes. Fluff with a fork and serve. I don't measure these so amounts are approximate. * Feel free to play around with amounts, flavors and add-ins such as garlic (or garlic powder), parsley, etc. What is your favorite rice dish? Botanically Speaking...What Are You Eating? Yesterday's discovery that the pumpkin is actually a fruit instead of a vegetable leads us to question the things we eat. Are they vegetables, fruits or berries? Years back, before I became somewhat enlightened, I thought that vegetables grew in the ground, fruits and nuts grew on trees and berries on bushes. Still I would have thought that peppers were vegetables. This is one of those things that just when you think you have it figured out, Bam! It is not what you thought at all. We are here to learn what is what because in the natural world, all is not clear. First of all, what are the botanical definitions of fruits, vegetables and berries. The word vegetable has no botanical meaning, but is based on the part of the plant and is used to categorize the foods we eat that do not fall into the fruit/berry category. The fruit is the seed-bearing structure in flowering plants (angiosperm) formed from the ovary after flowering. Fruits are the means by which the angiosperm disseminate seeds. Berries are technically a fruit with multiple seeds on the inside surrounded by edible flesh. To a botanist, tomatoes, eggplants, grapes, persimmons and chili peppers are also berries, so try and wrap your head around that. Based on this definition, a banana is also a berry. Okay, now that we have some definitions, let's look deeper. We have pretty much established what vegetables are, and that seems fairly straight forward. The more confusing issue is the fruit and/or berry question. All berries are fruit. There are subcategories of fruits, and the categories some of them fit into may surprise you. Some foods that you know as berries aren't really berries at all. Included are strawberries, blackberries and raspberries. Blackberries and raspberries are considered an aggregate fruit. Aggregate simply means that the fruit is made up of multiple little sections. 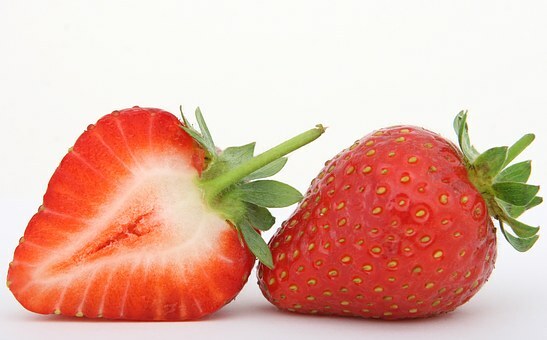 Strawberries are particularly strange because their seeds are on the outside, rather than the inside. For this reason they are known as accessory fruits. Perhaps that is because they wear their seeds like accessories? In addition to berries, there are other subcategories of fruit such as citrus, drupe or stone fruit (peaches) and pome (apples). Wow, that is a lot of information. So what do we take away from this? Vegetables are leaves, flowers, stems or stalks, roots, bulbs and tubers. Examples of vegetables are potatoes, broccoli, carrots, onions, beets, rhubarb, greens, turnips, Brussels sprouts and asparagus. Fruits are the seed-bearing part of the plants. 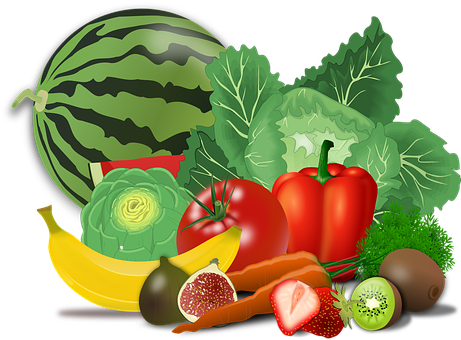 Examples are watermelon, all legumes, avocados, squash, pumpkin, eggplant, okra, cucumber, nuts, olives, corn and peppers. You may be questioning why corn is listed here. While eaten as a vegetable or grain, botanically speaking, it is a fruit. Berries are a subcategory of fruit, and most of what we thought were obviously berries are not. All this lends new meaning to getting your kids to eat their vegetables. Corn, Is it a Fruit, Vegetable or Grain? Classifying Fruit is an excellent article detailing the different categories of fruits. In the Springtime, a young man's fancy turns to love. In the Summer, our thoughts are filled with sunny days, vacations, and barbecues. When the weather turns cold, hot chocolate and visions of sugar plums and brightly-wrapped gifts abound. What about Autumn, that season of red, gold and green? Where do our thoughts take us? Why pumpkins of course. Pumpkins originated in Central America. They are a member of the squash family. Pumpkins are a fruit, not a vegetable as many of us thought. They are grown everywhere in the world except Antarctica. 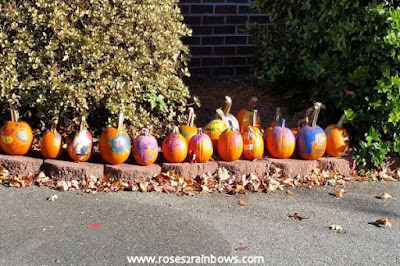 At one time pumpkins were used as a remedy for snake bites. Native Americans fed pumpkins to their horses. 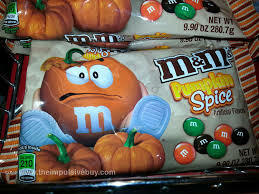 Only tan colored pumpkins are used for pumpkin puree. Back in the day, there was pumpkin pie and maybe pumpkin bread. Later emerged the ultimate pumpkin treat (in my mind anyway), pumpkin roll—that yummy rolled pumpkin confection filled with cream cheese icing and chopped nuts...preferably pecans, please. I loved pumpkin roll so much that one year my Mom asked a neighbor lady to make one for me for my birthday. So good! Fast forward 30 years or so and it seems there is pumpkin everything. As of October 2017, here is a partial list of all things pumpkin spice flavored. Pumpkin Spice Wine from the California Fruit Wine Co.
Pumpkin, it's not just for dessert anymore. In lieu of the cinnamon, nutmeg, ginger and cloves usually associated with pumpkin, you may choose cayenne, thyme, rosemary, turmeric, cumin or basil for your savory pumpkin dishes. Personally, I might add sage to that list, as well. The only way I have eaten pumpkin is as a dessert, and as pumpkin roll when I can get it. What is your favorite way to eat pumpkin? Have you ever tried a savory pumpkin dish? Bye the way, I intentionally didn't mention Jack-O-Lanterns. That's a whole 'nother post. An onion is an onion...or not. Who doesn't love a basket of freshly made onion rings? However not just any onion can be an onion ring. Keep reading to see which one makes the cut. One can do a lot of reading about onions, and there is more information than we can cover here in detail, so we are going focus on type and sizes of onions, the best use for each and a few of their health benefits. Have you ever looked at a recipe that calls for one large onion, chopped. What is a large onion and how much does that yield? I much prefer when the recipe states the amount in a quantity like one cup. Truthfully, I rarely measure, but if I know I need a cup, I can eyeball that. On the other hand, if it calls for a large onion, what is that comparitively? Okay, let's break that down because there is an actual onion size chart. This chart gives you an idea as to labels and sizes, but you need to know these equivalents, too. These onions have the strongest flavor and good for caramelizing, especially in French Onion soup, because of their higher sugar content. Red onions are often served raw and usually used on sandwiches, burgers and salads. They are also used for grilling and roasting. You want to look for these when you need a little texture in your dish. They are used in salads, white sauces and Mexican cuisine. To more easily spot sweet onions, look for a more orange skin. Walla Walla and Vidalia are types of sweet onions. They have a mild flavor and a higher water content, which makes them good for salsas. These are also the best onions for onion rings. These are the stalks of onion bulbs and are best used raw or lightly cooked. They add a mild flavor to your dish, and are often used as a garnish. In addition to their great taste and wide variety of uses, onions of all kinds are good for you, too. In summary, onions of all kinds are flavorful, healthful additions to our diet. I hope this helps you choose the right onion for your dish and your taste buds. Personally, I seriously do not like red onions as the taste and smell is very off-putting to me. My favorites are the sweet onions, followed by regular yellow onions, for all my cooking needs. Which onions do you prefer? Do you have a favorite onion-centric recipe? Are They Yams or Sweet Potatoes? That is a good question, and one I am glad you asked. With Thanksgiving just around the corner, it is something we should explore, so before you say "Please pass the yams," you might want to read this. 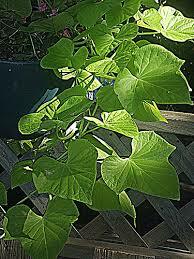 The yam is a tropical tuber native to Africa and Asia, and is related to lilies and grasses. While yams are similar to sweet potatoes, they are an entirely different plant species. The confusion is compounded by the fact that sweet potatoes canned in the U.S. are often incorrectly labeled as yams. Yams have a higher moisture content and more natural sugar than sweet potatoes, but they also have less Vitamins A and C. There are over 100 species of yams ranging from small potato size to over 5 feet long. Can you imagine if sweet potatoes grew to that size? Depending on the variety, their flesh ranges from off-white to dark brown. Sweet potatoes, on the other hand, are the edible root of a plant belonging to the Morning Glory family. Surprised? If you've ever seen Morning Glories, then you will notice the resemblance. Sweet potatoes also come in many varieties, but the two most often grown commercially in the U.S. are the pale ones with light yellow skin and the darker orange ones. The pale ones are not sweet and cook up more like a baking potato. The dark ones have an orange flesh, are sweet and have a higher moisture content. All sweet potatoes are high in Vitamins A and C. The orange ones are the only ones I have cooked or eaten, and are the ones I find as fries in restaurants. My favorite way to eat sweet potatoes is the opposite of what you find on your Thanksgiving table. I like them fried or roasted with Cajun or other spicy seasoning. To me it makes a nice balance of sweet and spicy. How do you eat sweet potatoes? I have been experiencing technical difficulties, so Into the Kitchen will take you to the Sea Hags Bar & Grill in St. Pete Beach, FL. 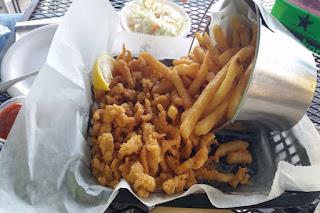 They have probably the best fried clams I have had outside of New England. They are fresh, hand breaded and fried to golden brown perfection, served with fries and slaw. Pair them with a view of the water and a cold beer, and that is a combination that is hard to beat. This was not a compensated post. We go there at least once every time we are in the area...the clams are that good! Hopefully things will return to normal next week.